The stats from our first-ever festival recycling initiative are in, and they’re stunning! The initiative, spearheaded by GrowNYC, a nonprofit that aims to improve New York City’s quality of life through environmental programs, helped us divert 45 percent of the festival’s estimated 2035 pounds of total waste (including trash and recycling) from the landfill! That’s over 900 pounds of “waste” recycled from the event. Most events in the city don’t have any recycling at all, so 45 percent diversion is a great success! We are excited about our partnership with GrowNYC, and want to spread the word about the great tools and services that the organization provides to improve the city and our environment. GrowNYC coordinated all of the festival’s recycling bin set-up, and provided amazing volunteers who made the initiative such a success! Thanks to GrowNYC! We hope you’ll come back again next year and take us to even higher recycling heights! Short ribs? In a hash? We’re in! Especially if it’s the short rib hash from Sarabeth’s! Make it gluten free at Taste of Tribeca and our brunch date with destiny is sealed. Have you ever found yourself in the Catskills, drinking beer around a campfire and gazing at the stars? If not, maybe you should try it! And when you do, we hope you’re drinking Nightshine Black Lager from Catskill Brewery. Try a pour of Catskill Brewery‘s “honest, hardworking beer” tomorrow at Taste of Tribeca. We’ll call it homework. Thalassa Restaurant doesn’t skimp on its seafood, and its rock star presentation is pretty cool, too! (Seafood in a cone?!) Come enjoy the fresh fare from this authentic Greek eatery tomorrow! Can we call this pasta? Need another reason to come to the festival tomorrow? Landmarc takes pasta to another level with its Orecchiette Alla Norcina. This dish will go fast! There are lively debates among foodies about which is better: Nobu or Nobu Next Door. We think that both restaurants are great, but are glad that Nobu Next Door does so much to accommodate our busy and sometimes-complicated lives. Like a good raw bar? Take a seat. No reservations? Fine. Need takeout? They have it. For Taste of Tribeca, the Japanese cuisine restaurant is at it again with its black cod butter lettuce dish. If you’d like to eat it gluten free, just ask for the shredded phyllo to be left off, and enjoy! Nobu Next Door to the rescue yet again! 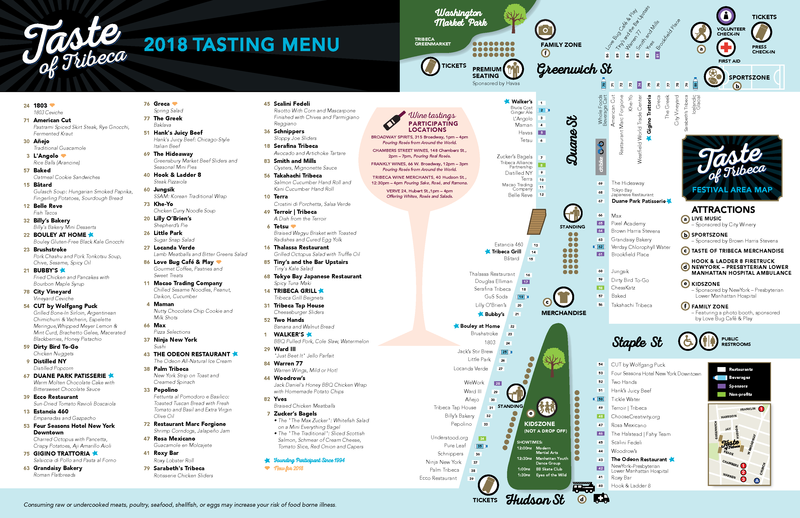 *For a full(ish) list of gluten free options at Taste of Tribeca, see our previous post, Gluten Free Festival Options.